"This is the perfect Thanksgiving Day dessert! 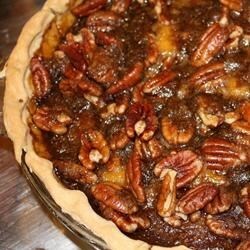 This recipe gives you the best of both words, pecan pie and pumpkin pie in one. It's delicious, rich, and mouthwatering! It will look like you spent hours, but it's really very easy to make. You'll definitely receive compliments and repeated requests for this dish." Beat the eggs, pumpkin, and half-and-half together in a mixing bowl until smooth. Stir in the sugar, flour, lemon zest, vanilla, salt, cinnamon, nutmeg, and allspice until evenly blended. Pour the pumpkin mixture into the prepared pie shell. Cover the edges of the pie with aluminum foil strips to prevent burning. Meanwhile, prepare the pecan caramel topping by mixing the brown sugar, pecans, and butter together in a bowl until evenly blended. Carefully spoon over the top of the pie. Continue baking the pie until the topping is golden and bubbly, and a knife inserted in the center comes out clean, about 20 minutes more. Cool on a wire rack. DELICIOUS!!! What a great variation from the traditional pumpkin pie. The perfect blend of two great holiday pie flavors. Thanks for sharing.